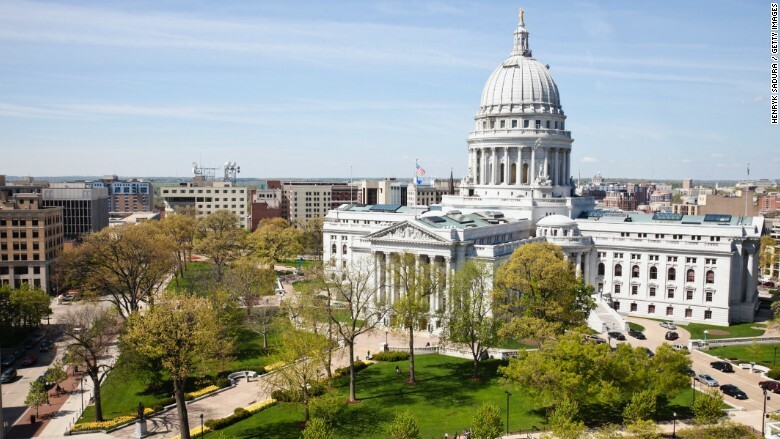 Madison, Wisconsin ranks in the top 40 cities for overall growth, productivity and wage gains. American cities powered the U.S. economy out of the recession and into its recovery. Out of America's 100 largest metro areas, almost each one improved on some measure of economic growth, employment, productivity or average wealth per person. The one red flag: wages. Median wages declined in 80 of those cities between 2009 and 2014, according to a new study released Thursday by the Brookings Institution. The wage declines were more pronounced among minorities than whites. Also, the wage gaps widened between races in cities with economies that ranked high overall. So while almost all of the top 100 cities grew and prospered between 2009 and 2014 on some measures, many struggled to create a more inclusive or stronger economy. Only eight cities out of the largest 100 saw median wages and employment rates rise while its poverty rate fell. "I was surprised by how few metro areas saw improvement in each of the three measures of economic inclusion," said Richard Shearer, one author of the Brookings report. The three metrics of "economic inclusion" in the Brookings report were: change in median wages, its poverty rate and its employment rate. Denver, San Jose, Calif., Provo, Utah and Charleston, S.C. are among those few metro areas that saw economic inequality decrease overall. But even for these cities, when you slice the data by race, a different picture emerges. For example, take Provo -- which currently has a shockingly low unemployment rate of 2.7%. It was one of the top performing economies in the U.S. overall. However, the median wages of white workers in Provo rose about 2% between 2009 and 2014. And the paychecks of black workers declined by nearly 20% in that time period. Provo isn't alone. Madison, Wisconsin has seen its metro area thrive on many metrics during the recovery. It ranks in the top 40 cities for overall growth, productivity and wage gains. But whites wages rose 11% while Hispanics' wages declined 26% and blacks' fell 7%. New York City -- America's largest metro -- experienced a similar trend. White workers saw a small uptick in wages but black and Hispanic workers saw wages drop 4% and 7% respectively. Its black poverty rate went up a bit and stayed flat for whites. Wage growth has been largely absent during the U.S. economic recovery, and it's a big reason why many middle class Americans feel they haven't benefited. Only in recent months has wage growth started to move in the right direction nationally. Despite the bleak wage picture, there are still impressive growth stories in America. Austin, Texas, remains the gold standard. Its economy grew 32% and the number of jobs increased by nearly 20% between 2009 and 2014. In Austin, median wages actually fell a bit for whites, but blacks saw double digit gains and Hispanics saw wages tick up too.